Retro styling meets functionality and reliability with our Warehouse series of gooseneck light fixtures. These commercial grade aluminum fixtures are suitable for any exterior or interior application. 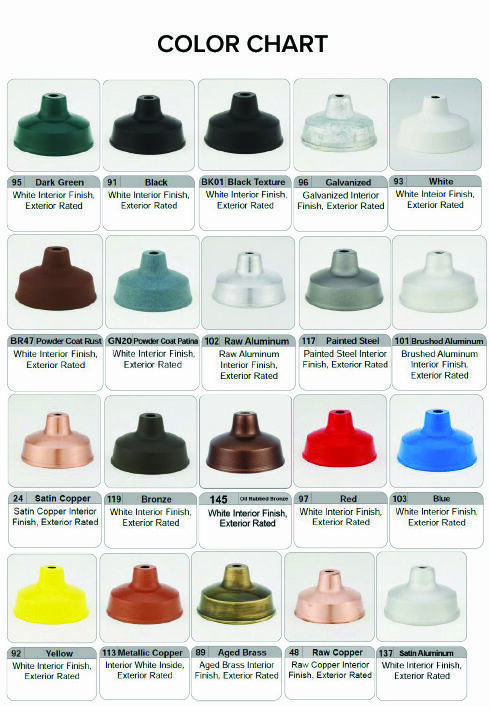 Available in over 20 colors each fixture is a build to suit item. As a result, you have the flexibility to mix and match different shade and arm styles, colors, optional accessories or power sources. After you place your order, your fixtures will be made to your specifications and then shipped immediately upon completion. Each gooseneck warehouse light comes with a 4 5/8" diameter round aluminum wall mount back plate and a medium base incandescent ceramic socket wired for 120V service. All back plates have mounting holes that are 3-1/2" on center to allow installation over any standard 4" diameter outdoor recessed (flush mounted) round or octagonal Junction box. Mounting options will vary for photocell sensors, compact fluorescent or metal halide ballasts. Call for details. The aluminum back plates, gooseneck arms and shades are all powder coated to match the color of your choice (please note: the "inside" of each shade is powder coated White for maximum reflectivity). Each Warehouse gooseneck fixture is UL listed (US and Canada) and designed for durability as well as many years of worry free operation. Typical bulb type/size is PAR20 for the 12", 14" and 16" dia. shades. The "PAR" style floodlight bulbs can easily be found at your neighborhood home improvement center or local hardware store.